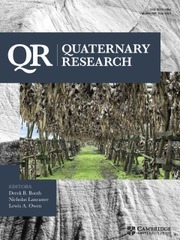 Quaternary Research is an international journal devoted to the advancement of the interdisciplinary understanding of the Quaternary Period. We aim to publish articles of broad interest with relevance to more than one discipline, and that constitute a significant new contribution to Quaternary science. The journal’s scope is global, building on its nearly 50-year history in advancing the understanding of Earth and human history through interdisciplinary study of the last 2.6 million years. Research areas include geoarcheology, geochemistry and geophysics, geochronology, geomorphology, glaciology, neotectonics, paleobotany and paleoecology, paleoclimatology, paleogeography, paleohydrology, paleontology, paleoceanography, paleopedology, quaternary geology, volcanology and tephrochronology.